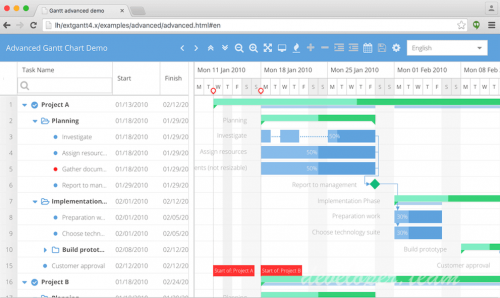 With Ext Scheduler you can schedule pretty much anything with a start and end date. Since our products are fully cross browser, you can be sure that they will work in IE, Firefox, Chrome, Safari etc. You can also leverage the Ext JS component model and extend our components as well as create your own plugins to add your own functionality. Our products can easily be integrated in any web application environment: Java, PHP, ASP.NET or any other web stack. Supported browsers v2.x: Chrome, Firefox, Safari, Opera and IE7+ (in Strict mode). Easy to localize to support any language. Add any custom columns. Inline editing supported for all data fields. Data can be sorted using any field or criteria. Zooming from milliseconds to year, customizable zoom levels. Customize the task look and feel using any HTML + CSS. Drag and drop reordering of rows in the left grid. Drag and drop of scheduled tasks. Configurable time scale with up to 3 header rows, from ms to years. Built with Ext JS, but can used together with any other 3rd party JS libraries (such as Bootstrap, jQuery or Angular). Two build versions available, a readable development build with source code comments and a minified build for production use. You can also build your own custom version to minimize the footprint. Comes with a flexible API where you can override pretty much any part of the codebase. Load and save data in JSON or XML. Custom data formats can also be supported. Either use the standard Proxy classes in Ext JS or use our custom CrudManager class (v3.0+). Fully working implementations with PHP, Java or ASP.NET. Row height is customizable, and can be changed dynamically. Tasks can be easily styled individually, either by putting CSS classes on the Model data, or by using the eventRenderer method.